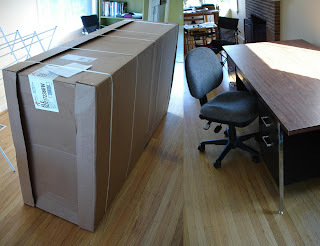 On Monday, my Alera 72" Double Pedestal Steel Desk arrived. It was fortunate that the Staples truck came equipped with two beefy guys to haul it into the house, as the shipped weight was 224 pounds. "Well at least it slides ok" is what the delivery guys said when I said I'd have a hard time maneuvering it to assemble it. That's $0.24 per pound, a bit less than the raw cost of the steel used to construct it.